The motion plastics specialist igus has presented a new electronic diagnostic tool for energy chains. The EMA system prevents unexpected down time in the system as well as unexpected repair work. Energy chains used in the crane business are installed as a long life, low-maintenance solution for moving energy, data or control cables for the trolley or main crane power supply. The igus e-chain protects the cables and controls the cable movement — only when the crane is in operation the system moves. The new igus EMA system is an easy installed polymer wire in the energy chain providing high safety for the application and the user. Through the maintenance signal the system is observed permanently and in case of problems due to external reasons (i.e. vandalism or overload) it sends a signal for replacing the chain link at the next possible opportunity. 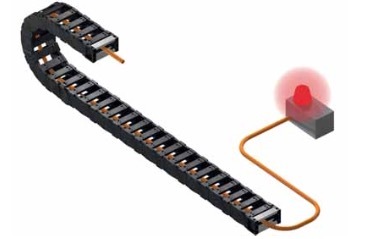 The EMA system is easy installed through manufactured separating crossbars that route the sensor polymer wire in the energy chain and attach the detection unit on a fixed point. In combination with the igus PPDS system now igus has the complete e-chain system observation and function control. igus GmbH is a globally leading manufacturer of energy chain systems and polymer plain bearings. The Cologne-based family business has offices in 36 countries and employs around 2,700 people around the world. In 2014, igus generated a turnover of €469 million with motion plastics, plastic components for moving applications. igus operates the largest test laboratories and factories in its sector to offer customers quick turnaround times on innovative products and solutions tailored to their needs. The terms ‘igus, e-ketten, e-kettensysteme, chainflex, readycable, easychain, e-chain, e-chainsystems, energy chain, energy chain system, flizz, readychain, robolink, pikchain, triflex, twisterchain, invis, drylin, iglidur, igubal, xiros, xirodur, plastics for longer life, CFRIP, dryspin, manus and vector’ are protected by trademark laws in the Federal Republic of Germany and internationally, where applicable.